The Office of Management and Budget has issued a call for more rigorous program evaluations. According to Jeffery Zients, acting OMB director, “Where evidence is strong, we should act on it. Where evidence is suggestive, we should consider it. Where evidence is weak, we should build the knowledge to support better decisions in the future.”[i] Assuming this directive will trickle down to many nonprofits using federal dollars, using imperfect metrics for evaluations are becoming accepted, especially for smaller nonprofits, which can’t afford statistically significant studies. These resources are needed to deliver services. In addition, evidence based imperfect metrics can help track progress and drive change. Evidence base evaluations will becoming a more important part of nonprofits’ evaluations and can be highly useful when the evidence is suggestive. If the evidence is weak, it still has the potential to advance the evaluation process, track progress and drive change. [i] Daniel Stid, (5/23/2012) “The ‘what works’ movement picks up political speed,” Bridgestone Group. [ii] Jerry Talley & Eugene Fram (Winter 2010) “Using imperfect metrics well: Tracking progress& driving change,” Leader to Leader Journal, pp. 52-58. 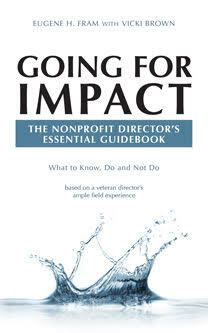 ← How Long Should A Nonprofit Director Serve?